First, I feel like I should start off with disclosing that I feel like you should immediately decide to make multiples of this cake, because it doesn’t make a huge cake and seriously, one slice is not enough. Next time I’m going to try doubling the recipe and making more like a 9 x 13 version. I made this for my dad’s birthday…in September. For some reason, I seem to have a problem posting his birthday cakes in a timely fashion which is particuarly odd, because they’re always some of the favorite things I make. See cassata cake and German Chocolate Cake…oh wait, no link for German Chocolate Cake because there’s no post yet – case and point…GET IT POSTED ALREADY, PAMELA. My dad’s favorite desserts are Cassata Cake, German Chocolate Cake, Pineapple Upside Down Cake, and Banana Pudding…so expect to see an awesome banana pudding recipe somewhere around the year 2015. Don’t wait that long to make this, because it’s delicious! Drain pineapple and place in one layer on paper towels to absorb the excess juice. Place the 3 tablespoons unsalted butter in a 9×2-inch round cake pan. Place the cake pan in the oven until the butter is melted then remove and tilt to coat all sides with butter. 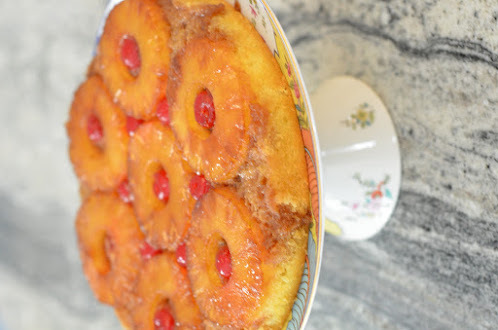 Sprinkle the brown sugar evenly over the bottom of the pan then place the pineapple rings evenly in the bottom of the pan starting with one pineapple ring in the center of the pan. Place the maraschino cherries in the center of each ring and in the spaces between them. In a small bowl, whisk together eggs, 2 tablespoons of buttermilk, and vanilla. In a mixer bowl, whisk together the flour, sugar, baking powder, baking soda and salt. Add the 6 tablespoons of unsalted butter and 6 tablespoons of buttermilk. Beat on low speed until the flour is moistened, then increase the speed to medium, or high if using a handheld mixer, and beat for 1½ minutes. The batter will be stiff. Add one-third of the egg mixture at a time, beating for 20 seconds and scraping the bowl after each addition. Scrape the batter over the pineapple in the pan and spread evenly. Bake until a toothpick inserted in the cake comes out clean, 35 to 40 minutes. Remove the cake from the oven and tilt the pan in all directions to loosen the cake from the sides of the pan. Let cool for 2 to 3 minutes before unmolding. Invert a serving platter on top of the pan. Being careful to not burn yourself, use oven mitts!, flip the platter and cake over together to turn the cake onto the platter and remove the pan. We had friends coming to visit so I decided it would be a perfect time to try this torte. But, I realized two things — 1) it tasted a lot better to me the next day and 2) being the weird texture nut – no pun intended – that I am, I wanted to change one thing. The original recipe calls for folding in part of the nuts with the chocolate chips into the mousse, but something about the nuts kept surprising me in combination with the silky smooth peanut butter filling, and I couldn’t decide whether I liked it or not. So, next time, my plan is to still mix in the chocolate chips but to reserve all the nuts and spread them on top of the ganache layer. How you want to make it is up to YOU! Okay, one last thing — this is it I promise. Oreo cookie crusts are delicious. I keep thinking maybe Oreo cheesecake with an Oreo cookie crust. OH. MY. GOODNESS. The End! To make the crunch, in another small bowl combine 1/2 cup of the chopped peanuts (if following my modification do not include these here), mini chocolate chips, sugar, espresso powder, cinnamon and nutmeg. Toss with a fork to mix and set aside. Using a large rubber spatula, gently stir in about 1/4 of the whipped cream just to lighten the mousse. Still working with the spatula, stir in the crunchy peanut mixture (if desired), then gingerly fold in the remaining whipped cream. Scrape the mousse into the crust, mounding and smoothing the top. Refrigerate for at least 4 hours or overnight; cover with plastic wrap as soon as the mousse firms. Pour the ganache over the torte, smoothing with a metal icing spatula. Scatter the remaining peanuts (or all depending on whether you’re following the adaptation) over the top and chill to set the topping, at least 20 minutes. When the ganache is firm, remove the sides of the springform pan. Refrigerate until ready to serve. My dad’s three favorite cakes are cassata, german chocolate, and pineapple-upside down cake, so when we went to Cleveland this weekend for his birthday; I knew I would have to bring one of those three with me! The Cleveland-style is custard-filled, inspired by Corbo’s in Little Italy (YUM – can I tell you how sad I missed the feast and didn’t get my cavatelli and meatball fix?) as Sweet Amandine‘s post tells me. Eating it brings back a lot of memories of Catalano’s bakery which was closer and where it was available with or without white chocolate. I ended up making the cake in Tennessee the night before and making the custard and whipped cream in Cleveland. While it was a bit of a project, you’re able to do it in steps, and with the exception of some jumbo eggs from a farm market which caused the custard to be a little thicker yet still totally delicious, this came out very well. Albeit not the best picture ever since I wasn’t too interested in making my daddy wait to eat his birthday cake so I could fix it; it will definitely make the birthday cake rotation! You can make the custard and cake the night before. I took the suggestion of refrigerating the cake before spilitting, and it was a wise move! This can be done the night before. Whisk together the custard ingredients in a saucepan, then bring to a boil over medium-low heat, whisking constantly. Once it reaches a boil, lower the heat to a simmer and whisk until it becomes thick, 1-2 minutes. The custard will change almost instantaneously from a liquid one second to a custard the next. Turn down the heat so that the mixture just simmers, and whisk until thick, 1-2 minutes. Move it to a bowl and cover with plastic wrap or wax paper to cool and then cover and refrigerate the custard for a minimum of 3 hours, maximum of 2 days. Preheat the oven to 325 degrees. Line the bottoms of two 9-inch round cake pans with cooking sprayed or Baker’s Joy sprayed parchment paper or leave the pans ungreased. Combine the flour, 1 1/4 c. sugar, baking powder, and salt, and then sift it twice into a large bowl. In a separate bowl, place the yolks, water, oil, zest, and vanilla. Use an electric hand mixer on high speed to combine. Then mix in the flour mixture. In a third bowl, use your stand mixer or your hand mixer to beat the mixture of egg whites and the cream of tartar until soft peaks form. Once formed, add the remaining 1/4 cup sugar, and beat on high until the peaks are stiff but not dry. Fold about a quarter of the egg whites into the yolk/flour mixture. This “gets it started”, then you can fold in the remaining whites, but all the while you want to be as careful not to deflate the whipped egg whites while combining. Don’t overmix – as soon as you don’t see the egg whites – Stop! Divide the batter between your two baking pans (or use one 3″ pan like I did). Bake for around 35 minutes, but check beforehand. 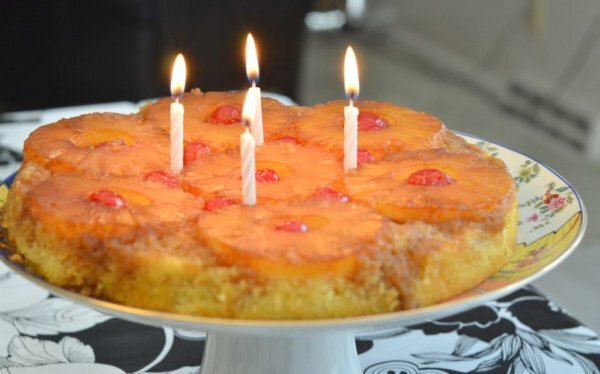 You want a toothpick inserted in the center to come out clean, and for the top of the cake to spring back to the touch. Once done, remove to a cooling rack for at least an hour. When the cakes are totally done cooling, run a knife around to make sure nothing is sticking and then turn out onto your plate. The top is a little bit sticky as the cake is almost like an angel food type texture. Wrap in saran and then stick in the fridge for at least 3 hours to make it easier to slice or leave it in there overnight. Slice the strawberries about 1/4″ thick. Combine in a bowl with 2 Tbsp. sugar and stir; leave for one hour. You can stir from time to time as they mascarate and give off their juice. Then, strain the strawberries, BUT RESERVE THE JUICE!!! Combine in a preferably chilled bowl the cream and sugar, and whip until stiff. Split the cake layers in half. Put down your first cake layer and brush the top of it with 1/3 of the juice from the strawberries. Then put down a layer of strawberries. Then top that with a layer of custard. Repeat until you finish with your final cake layer. Then using an offset spatula or regular spatula, spread the whipped cream over the entire cake. Chill for at least 8 hours; it only gets better the longer it has time to merry all the flavors together. When ready to serve, bring to room temperature. Serve with any remaining mascerated strawberries or fresh strawberries. Or white chocolate shavings! After Course I, I wasn’t able to take the Wilton cake decorating classes in order. Course II was going to be offered on a night the next month that I’d miss three of the four classes, so obviously not the way to go, so I just ended up taking Course III then Fondant & Gumpaste and then finally Course II. I did have to miss the class right before July 4th due to our travel to Cleveland, so I made it up this evening where I learned the rope border and basket weave. For dessert for the cookout I decided, against all rational thinking since I was putting this all together at the last minute, that I wanted to make a cheesecake. I settled on a Snickers cheesecake mostly because I ran to the store, picked up items I might be able to bake with and then decided what to make with what I had…wrong order. So I made a few adaptations; the original recipe called for a chocolate wafer crust, but *shock* I’m not a huge chocolate person, but I LOVE graham cracker crusts. Also, instead of the fudge sauce I decided to go with homemade caramel. Anyways, you’re also going to have to ignore the globs of caramel. Refer below to caramel being extremely hot and overheating it. On a side note, no one seemed to mind having a lot of caramel. Combine the graham cracker crumbs and butter, and press into the bottom and up the sides of a 9 1/2-inch springform pan. A springform will make it super easy to present the cheesecake without the ugly pan in the way! I pre-baked my crust in the oven to ward against it getting soggy, but I think I did it a few minutes too long, so next time I think I’ll just put it in for 5 minutes. I think I had put it in for 10 minutes originally. In your mixing bowl combine the softened cream cheese (very important that it’s softened – otherwise you’ll have chunks of it left unincorporated in your filling) and sugar. Beat until smooth. Then, one at a time, add each egg. Once incorporated, add the heavy cream and vanilla. Scrape down the bowl, and then beat at medium speed for 5 minutes. Fold in the chopped Snickers, and pour the filling into the crust. Bake for approximately 1 hour and 20 minutes, or until the cheesecake is basically set in the center. Let cool on a cooling rack for 1 to 2 hours. If desired, you could add additional chopped Snickers to the top. Since we had put this cookout together at the last minute, I didn’t have time to chill it in the refrigerator, but I do think chilling it would have improved the flavor even more. For the caramel: Combine cream, brown sugar, corn syrup, and a pinch of salt in a 1 1/2-quart heavy saucepan over medium heat, bring to a boil, and stir until the brown sugar has dissolved. At this point, my candy thermometer wouldn’t stay in, so instead of continuing to boil until the candy thermometer reads 210 to 212°F which should have taken 12 to 14 minutes, I just made my husband stir it while I try to clear out some of the dirty dishes. I think our medium heat must be hotter, because I think we let it get too far in only half the time. This helped contribute to the gloppy drizzling, because it had gotten too thick. Also, at this point you’re supposed to stir in the vanilla, but in my haste, I forgot! It was still delicious. Once it becomes caramel, drizzle it over your cheesecake. Warning: The caramel will be extremely hot; I didn’t realize how hot, but luckily what I touched had cooled for a minute otherwise this recipe would have gone straight into the garbage for its offense!! Makes one 9-1/2 inch cheesecake. At our “pseudo” Mother’s Day brunch as we hadn’t been able to celebrate with each other initially, I made this sour cream coffee cake. It tasted delicious, but I definitely would like to try it again with a couple of changes. First of all, as you can see from the picture, I somehow didn’t get a nice line of streusel in the middle, so I think I’d put a little more than 1/2 of the batter in before adding the layer and maybe even make a little extra for the top. I promise one of these days I’ll get used to taking pictures and they won’t be afterthoughts! It’ll be fun to try again though, and maybe update this picture as this was gone in less than 24 hours! Cream the butter and sugar in the bowl of an electric mixer with the paddle attachment on medium-high for 4 to 5 minutes, until light. Beat in the eggs 1 at a time, then add the vanilla and sour cream. In a separate bowl, sift together the flour, baking powder, baking soda, and salt. With the mixer on low, add the flour mixture to the batter until just combined. For the streusel, combine the brown sugar, flour, cinnamon, salt, and butter in a bowl and combine using a pastry blender, a fork, or your fingers until it forms a crumble. Mix in the walnuts, if desired. Spoon half the batter into the pan and spread it out with a knife. Sprinkle with 3/4 cup streusel. Spoon the rest of the batter in the pan, spread it out, and scatter the remaining streusel on top. Bake for 50 to 60 minutes, until a toothpick comes out clean. Let cool on a wire rack for at least 30 minutes. Carefully transfer the cake, streusel side up, onto a serving plate. Whisk the confectioners’ sugar and maple syrup together, adding a few drops of water if necessary, to make the glaze runny. 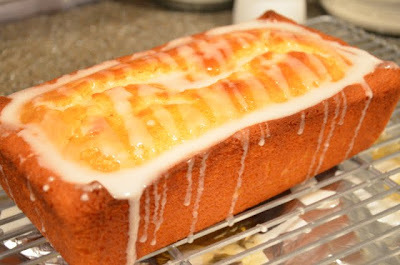 Drizzle as much as you like over the cake with the whisk or a fork or spoon.